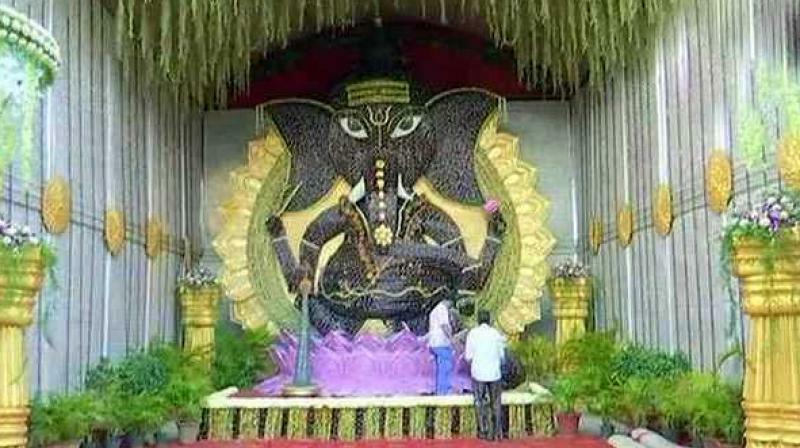 Hyderabad: With Ganesh Chaturthi around the corner, the devotees in Bengaluru have decided to add a touch of eco-friendliness in their celebrations. Sathya Sai trust in Bengaluru has made Ganesh idol using sugarcane shunning Plaster of Paris (PoP). Mohan Raj, a member of the trust told ANI, that each year they try to do something new and this time they chose to make the idol using sugarcane, which will be distributed to the people after 21 days of prayer. "We decided to go eco-friendly this time. The colours and Plaster of Paris causes damage to the creatures of the water, when immersed in it. After the pooja, the sugarcane which is used to make the idol will be distributed in the public," he said. Avinash, a worker who made sugarcane Ganesha informed that it took nearly a month and a half for them to create the idol. Even in Hyderabad, the devotees are preferring the idols made of mud instaed of Plaster of Paris. The sales of eco-friendly Ganesh idols have seen a sharp rise this year in the city. Eco-friendly Ganesha idols are those that are made out of clay, natural fibres, papers and other bio-degradable materials. Satish Kumar, a shopkeeper while speaking to ANI said, "There is huge demand of eco-friendly Ganesha idols. People are avoiding idols made of plaster. I am selling such idols from the past 4 years. This is even good for the environment and the price is also affordable." The festival of Ganesh Chaturthi will begin from September 13.